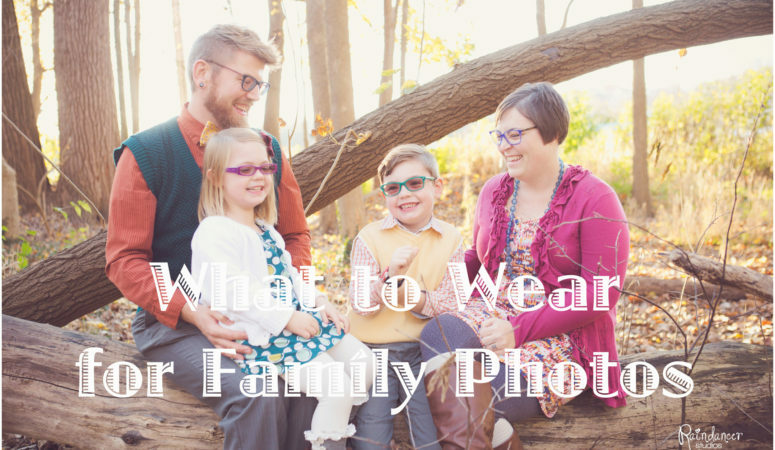 Do you feel stressed when picking out clothes for a family photo session? I know I do when it comes to my own family despite the fact I’m a professional family photographer here in Indianapolis. I tend to over-analyze it and stress out about the outfits looking good together. Honestly, most people do so you are not alone! Pick One Outfit First– Pick 1 favorite outfit that you absolutely love then coordinate everyone else based on the colors in that outfit. I think picking Mom’s outfit first is great because if Mom loves her outfit she will be happy and that positive energy rubs off on everyone else. But sometimes us Moms find a really cute patterned dress for our daughter and it makes more sense to use it as the central focus and then use it to gather colors from. Either way, I think picking a females outfit first is easiest! Sometimes picking a guys plaid shirt or shorts though can also set the tone and stage for pulling coordinating colors from so sometimes picking the guys outfit might make more sense if it’s something trendy. Coordinate Colors– Coordinating is the name of the game…not matching! This is why I think you should pick a girls outfit first because sometimes there are multiple colors going on that can help you pull out your coordinating colors from. If there aren’t any patterns with multiple colors then I would use simple color theory of what colors go well together. Think about contrasting colors. Lay all the outfits on the floor to see what looks best together. If your eye is drawn to something that stands out too much, it’s probably best to find a replacement. Feel free to look at my Pinterest Board to help you brainstorm. A good rule of thumb is to pick around 2-3 colors. Splash in the neutral colors as needed to bring balance. Mix It Up– Don’t fear mixing or integrating stripes, plaids and/or patterns. Hopefully the photos and Pinterest Board will help you feel confident to think outside of the box! I’m such a visual person so for me laying the outfits next to each other is key! Head to Toe- Shoes matter! Make sure kids shoes jive with outfits. Shoes that don’t match or go well with the outfit stick out in photos. So I would plan for shoes when you lay out the outfits. Hair and head accessories are great additions to dress up the feel for a girl! Hats are super cute for both boys and girls! Cut nails or remove/add nail polish because those can be noticeable in close ups. Be wise about the timing of haircuts. Haircuts take a few days to lay normal again. Kindly ask or remind your hubby to shave if it’s important to you. 🙂 Check everyone over head to toe the day before your session to see if anything needs attended to. Layer Up & Splash in Texture– When at all possible, layer up with accessories including scarves, sweaters, vests, leggings, jackets, hats, headbands, glasses, etc. The more textures you can add into the photo the better! It gives it a more stylized look and feel. AND…it also allows for you to be prepared in case it’s cooler outside than you hoped for. Stay Away From Fluorescent Colors– Fluorescent colors tend to wash out skin and distract from focusing on the people. Softer versions of the colors photograph better on people. Stay Away From Green in Grassy Pics– If you plan to have your session in a grassy area, do not choose to wear a lot of green because the grass and trees are already adding a ton of green to the photos. It’s ok if its a coordinating color thrown in, but I recommend not wearing a lot of green. Dress For the Crazy Indiana Weather– It’s so hard to prepare for Indiana weather. Any given day the temperature can fluctuate. This is another great reason to layer up the outfits just in case. OR I’d recommend having another alternative clothing option laid out in advance just in case. You don’t want to be stressed the day of your session because it shows in your photos. Mom and Dad’s stress affects the kids stress levels, too. It’s a chain reaction! 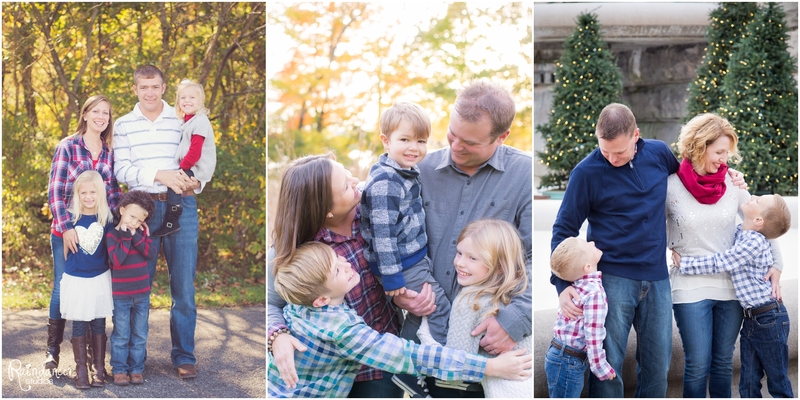 So, plan ahead to help your family be calm on the day of your session. Feel Good– Pick something that you feel good in. You know that outfit that makes you feel happier and more confident? Wear it! Think about it…and even ask a friend to rummage your closet with you. Make it a fun thing to try on clothes for your mom, hubby or best friend. If you don’t know what looks best, solicit advice from the ones who love you and know you best! Heck, even try on items at a store with a friend and have her help advise what looks most flattering, or ask the sales lady! If you feel insecure about your outfit choice, you will likely look back at the photos and not be happy. Show Off Your Best Feature– Whatever part of your body you like, own it! Wear something that makes that part of you shine. It’s ok to pick an outfit that hides or masks your least favorite feature, too! Again…if you feel good with what you’re wearing, others will see it and feel it in your photos! No Moisturizer or Make-up with SPF– It reflects light and that can show in photos. Try Something New– Take a risk and buy a new outfit or accessory to spice things up. If you wouldn’t normally wear a dress, hat, headband, scarf, or jewelry, consider going outside of the box to stylize the session a little more. Spoil yourself a little and you’ll feel dolled up and cute in the pics. Make-Up– Do not fear to wear a little more than normal. Actors, actresses, and models do and brides do on the day of their wedding for a reason. If you like a more natural organic look, consider possibly wearing some lip gloss, mascara, and blush. Coordinate With Home Colors– If you don’t know what color scheme to roll with, consider where you’d want these photos hanging in your house! Will it coordinate well with the home decor? Lay It Out– ALWAYS lay the clothing out on the floor or bed. Swap out different items to see what looks the best together. Text, Email or Facetime Jill– Seriously! Please text or email me photos of what you come up with. I can give you my honest opinion and save you a lot of stress! Comfort– Pick something your kids will be comfortable wearing and not upset over. Set aside your own agenda and listen to your kids needs. Would you rather have a kid throwing a fit the whole session or a happy kid who is not stressed? My vote is always to go with less stress!! If you know your daughter hates fancy dresses please don’t her in one. If one hate jeans, like my daughter, please don’t force them to wear them! “Let it go! !” 😉 Consider their needs and I promise you’ll love the photos. Consider Their Personality– If you have a kiddo who is on the move a lot, dresses can be hard. Babies often need to wear a diaper cover or pants under a dress. Feel free to layer it with some leggings so you don’t have to worry about showing unmentionables. 🙂 If a kiddo LOVES their favorite boots, make a compromise to wear Mommy’s shoes of choice first and then boots for some of the session. Trust me, if you let your kid be who they are…you will love the memories of looking back and smiling at the memorable moments in this stage of life. I am always will to negotiate with kiddos to make them feel like they have ownership and control, too. Their Favorites– If your kiddo has a lovie or favorite something, most definitely bring it. If it’s in the photo…who cares?! Life is too short. Again, I repeat there is power in negotiation. Photos with and photos without. Even if it’s not in the photo, I can use it to be silly or play with to get their attention. And I love individuals of kids doing their own thing with their favorite things, too. Back-up Options– It might be wise to have extra clothes with in case of a diaper explosion, a spill, an accidental mud experience, etc. Consider your kiddo and their normal needs. Always best to be prepared just in case especially with little ones. Words on Clothing– I feel like words on clothing are hard to photograph. Some letters are always cut off. So just keep that in mind. I find it distracting and it makes me stare at the shirt in photos wondering what it says instead of enjoying the people and connection. I think it’s best to stray away from this for the family photos. It’s easier to use clothing with wording on individual pics of kids, which is great for some milestone shots. Newborns– Keep it simple. Most often I just wrap them or leave them naked. I have tons of wraps to use, but if you want to bring a onesie or outfit, coordinate it with your outfits. Parents outfits I recommend to be on the simple side…not too bright or have crazy patterns. It helps the focus to be on the babies! -LulaRoe and Matilda Jane Vendors (for girls)- message me for the contacts I have! -Don’t discount places like Kohls, Goodwill, JC Penny, Walmart, etc. for some cute inexpensive finds, too! -While shopping in a store, feel free to ask a sales associate to help. They give free advice on coordinating and can help you find clothing that will go well together. 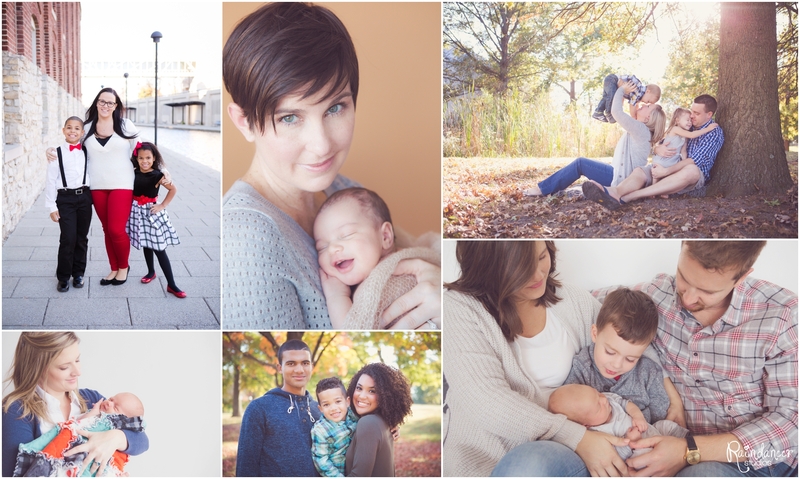 *Jill Howell specializes as an Indianapolis family photographer, children photographer, and newborn photographer but also loves high school senior photography and wedding photography. She does studio photography in Indianapolis and on-location photography in Indianapolis and surrounding areas such as Columbus, Greenwood, Avon, Carmel, Zionsville, Fishers, and Westfield, IN. However, she is a travel photographer and willing to come to you, too! Contact Jill at raindancerstudios@gmail.com.